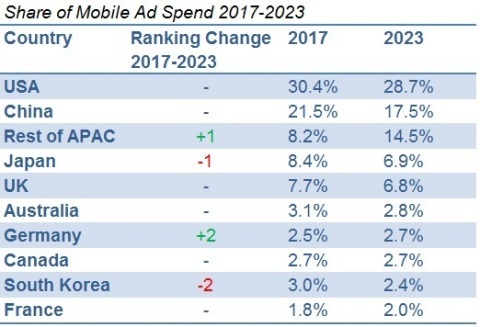 BOSTON--(BUSINESS WIRE)-- The strong growth in mobile advertising expenditure enjoyed by mobile publishers is set to slow significantly over the next five-years according to a new report from Strategy Analytics , Global Mobile Advertising Forecast – 2010-2023 . After growing over 6-fold between 2013 and 2018 growth in mobile advertising revenue will fall to a 12% CAGR and the market value will reach $222 Billion in 2023. The mobile share of digital advertising will grow rapidly in less developed advertising markets but in advanced markets the share over mobile is reaching a plateau. Strategy Analytics expects mobile advertising to continue to suffer from headwinds including increased cautiousness following Facebook’s Cambridge Analytica scandal and the implementation of GDPR in 2018. Search will remain the dominant mobile advertising format with 47% of ad spend across the period while mobile video ad spend will be the fastest growing (+16.5% CAGR over 2018-2023) driven by the adoption of 6-second mid-rolls, and vertical ad formats by industry leaders Snapchat, Facebook and more recently YouTube.